We have released an update to our Marketing Automation and Social Technology report. Our evaluation reports follow a rolling-update calendar, and the vendors updated in this edition include Oracle, Salesforce, IBM, and Act-On. We've also added two new vendors: Infusionsoft and Vuture to our evaluation lineup. Here is a sneak peek of the detailed evaluations inside. Act-On provides little sophisticated landing page management functionality or advanced social media monitoring, but it offers decent lead nurturing functionality centered on email campaigns. After getting acquired in 2014, IBM Silverpop now jostles for space amidst the smorgasbord of marketing software solutions that IBM sells. Silverpop offers little by way of social marketing services, but it has gone beyond its legacy B2C roots and checks off some advanced B2B features. Infusionsoft is focused on very small businesses whose needs are very different from large enterprises. Infusionsoft does not cover all the bases, but it does provide an integrated suite for CRM, marketing and sales automation, and online shopping use cases. Oracle's digital marketing capabilities are dispersed across Marketing Cloud and Social Cloud. Marketing Cloud is a collection of acquired tools including Eloqua, Compendium, BlueKai, and Responsys. Eloqua is the longest-standing B2B marketing automation tool in the market, but is also very complex and is overkill for many mid-size customers. Oracle Social Cloud, or less grandiosely, the Social Relationship Management suite is an amalgamation of Vitrue, Involver, and Collective Intellect. Integration among these social tools as well as with Eloqua/Marketing Cloud tools remains a work-in-progress. Salesforce ExactTarget Marketing Cloud is (not surprisingly) comprehensive but complex. The learning curve for marketers can be steep, but you can pursue various digital marketing scenarios. Salesforce ExactTarget Email is (as the name suggests) intended mainly for B2C email campaigns. It is not yet 100% integrated with the other components of Salesforce Marketing Cloud, but the connections are improving. Salesforce Pardot offers you the tradeoff of ease of use/simplicity versus depth of functionality, which is the case for other SMB-oriented solutions. Vuture is a UK vendor that targets the marketing automation requirements of professional services firms, but is well-integrated with certain CRM systems. 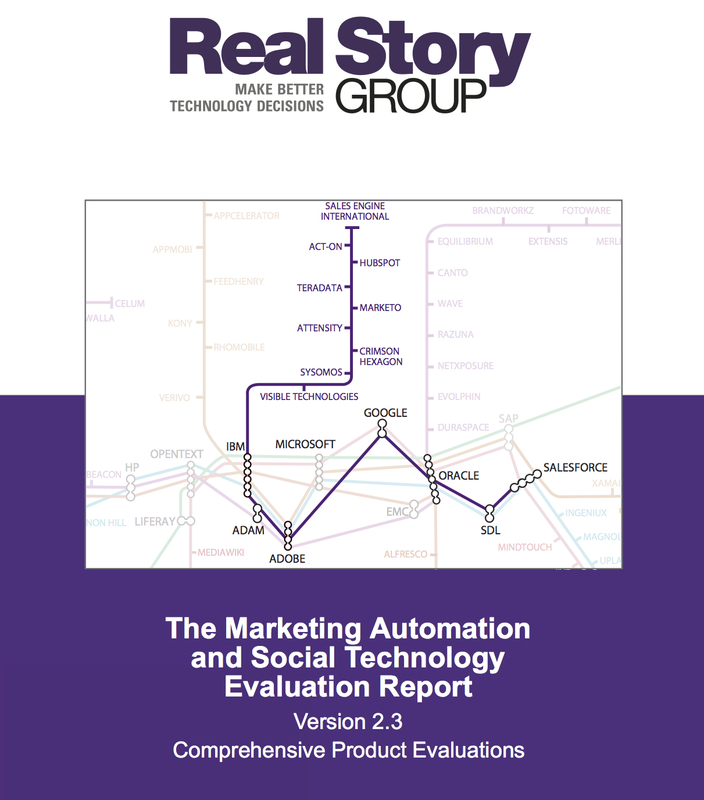 This 295 page report is available for immediate download to RSG's Marketing Automation and Social Technology subscribers. If you are not yet a subscriber, you can download a sample evaluation.